Howard Miller Mia is finished in Worn Black with red and brown undertones on select hardwoods and veneers. 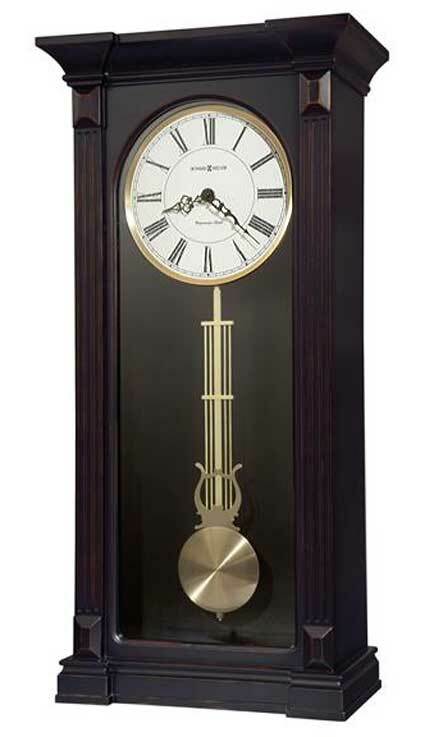 This handsome wall clock features fluted columns with raised beveled column caps and flat glass that encases the dial and brushed antique brass-finished pendulum bob with brass-finished harp and lyre. Aged dial with aged black Roman numerals, black serpentine hands and a brushed antique-brass finished bezel. Requires four AA sized batteries. 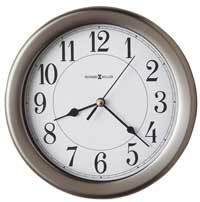 Quartz, battery-operated, single-chime movement plays Westminster melody on the hour and counts the hour. Automatic nighttime chime shut-off. 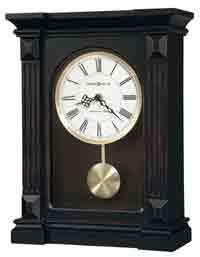 Size: Height 25.75" Width 12.5" Depth 6.25"
Listen to the Westminster Melody found on this clock. 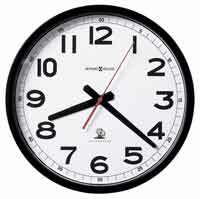 Clocks for sale at The Clock Depot including the 625-603 at discount prices.